An Indian navigation satellite remained stuck to its launcher after climbing into orbit Thursday when the rocket’s aerodynamic payload shroud failed to jettison as planned several minutes after liftoff, dealing the country’s workhorse booster its first total failure since 1993. Video from an on-board camera appeared to show the IRNSS 1H navigation craft still cocooned inside the fairing long after it was supposed to separate. The chairman of the Indian Space Research Organization, A.S. Kiran Kumar, declared the launch a failure in a press conference after the flight, according to Indian news reports. 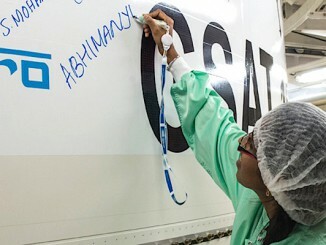 An Indian Polar Satellite Launch Vehicle blasted off at 1330 GMT (9:30 a.m. EDT) from the Satish Dhawan Space Center on India’s east coast with the eighth satellite for the country’s regional navigation network. The payload was supposed to replace a spacecraft launched four years ago with faulty payload components. Liftoff occurred at 7 p.m. Indian Standard Time. The 144-foot-tall (44-meter) PSLV attempted to heave the eighth satellite in the Indian Regional Satellite System — IRNSS 1H — into an orbit stretching more than 12,800 miles (20,650 kilometers) above Earth. But the rocket carried the extra weight of its clamshell-like nose cone all the way to orbit. Burdened with the extra load, the PSLV’s fourth stage reached an orbit with a maximum altitude of 4,072 miles (6,554 kilometers). ISRO’s range operations director confirmed the payload fairing, or heat shield, remained attached to the rocket. 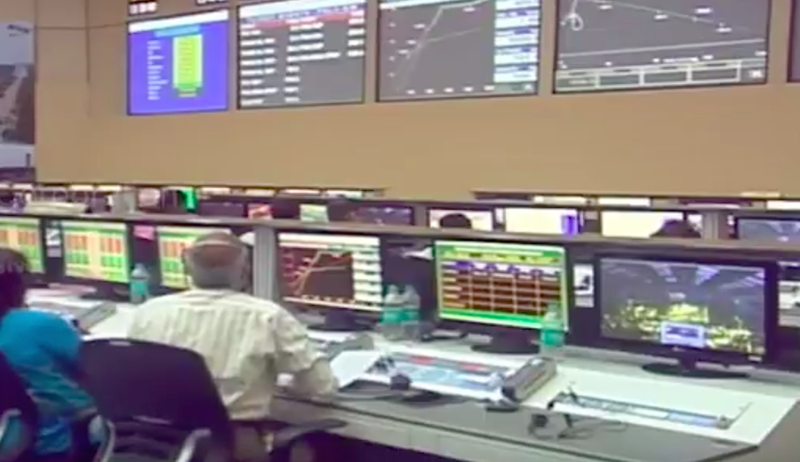 A video monitor inside the PSLV launch control center appeared to show the IRNSS 1H satellite trapped inside the fairing well after the shroud was supposed to jettison. 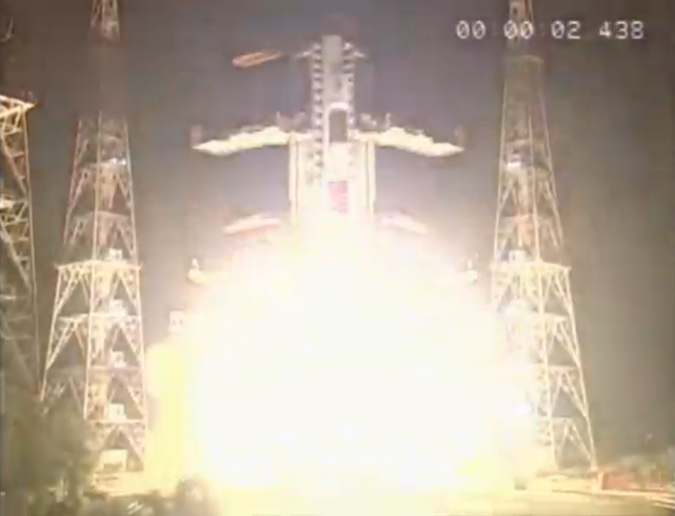 The payload fairing was programmed to release at T+plus 3 minutes, 23 seconds, once the PSLV soared above the dense lower layers of the atmosphere. The structure shields the satellite from weather during the final launch countdown, then protects the payload from aerodynamic forces as the rocket climbs into space. Thursday’s mishap was the first incident on a PSLV launch since 1997, when a rocket delivered an Earth observation satellite to a lower-than-planned — but usable — polar orbit. It was the first total PSLV launch failure since the rocket’s inaugural flight in 1993, a span of 39 successful and partially successful missions in a row. Two versions of India’s larger Geosynchronous Satellite Launch Vehicle — the GSLV Mk.1 and GSLV Mk.2 — have a more mixed record, with 7 successful flights in 11 attempts. IRNSS 1H was to replace the first Indian navigation satellite in the IRNSS fleet — IRNSS 1A — stricken with failed atomic clocks, eliminating its ability to transmit precise position data to users on the ground. Designed for a 10-year mission, IRNSS 1A is otherwise healthy can still be used for basic message relay functions, according to the Indian Space Research Organization. The three rubidium atomic clocks on the IRNSS 1A satellite have failed since its launch in July 2013, leaving the spacecraft powerless in achieving its primary mission. Sourced from a Swiss company, the clocks are needed to keep precise time on the satellite, a measure needed to help derive the exact location of a receiver on the ground. The rubidium clocks come from the same vendor as several clocks that have failed on Europe’s Galileo navigation satellites. Engineers say they fixed the clocks on the IRNSS 1H spacecraft launched Thursday, and the launch of the next batch of four European Galileo navigation satellites was delayed from earlier this year until December to ensure their clocks will not succumb to the same problem. Launching with six lengthened solid rocket boosters — a configuration ISRO calls the PSLV XL — India’s workhorse launcher headed east from the Satish Dhawan Space Center over the Bay of Bengal following liftoff Thursday. The six boosters, each packed with 12 metric tons of pre-loaded solid propellant, fired more than a minute. Four of the motors ignited at liftoff, and the other pair fired at T+plus 25 seconds. A core first stage solid-fueled motor burned in unison with the six strap-on boosters. The PSLV’s core and boosters collectively generated 1.7 million pounds of thrust. The first stage dropped away at T+plus 1 minute, 50 seconds, at an altitude of more than 180,000 feet (55 kilometers). A single hydrazine-fueled Vikas engine ignited for a firing lasting two-and-a-half minutes. The rocket’s clamshell-like payload shroud was scheduled to peel away during the second stage burn. A solid-fueled third stage motor ignited and burned nearly four minutes. The fourth stage, powered by two hydrazine-fueled thrusters producing around 3,400 pounds of thrust, then took over for a firing to inject the mission’s navigation payload into an elliptical, oval-shaped orbit high above Earth. 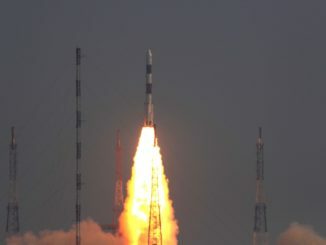 The PSLV’s flight computer aimed to release the IRNSS 1H satellite in an orbit between 176 miles (284 kilometers) and 12,831 miles (20,650 kilometers). The target orbit had an inclination of 19.2 degrees to the equator. The fairing failure caused the rocket to reach a lower orbit ranging in altitude between 103 miles (167 kilometers) and 4,072 miles (6,554 kilometers) at an inclination of 19.2 degrees. 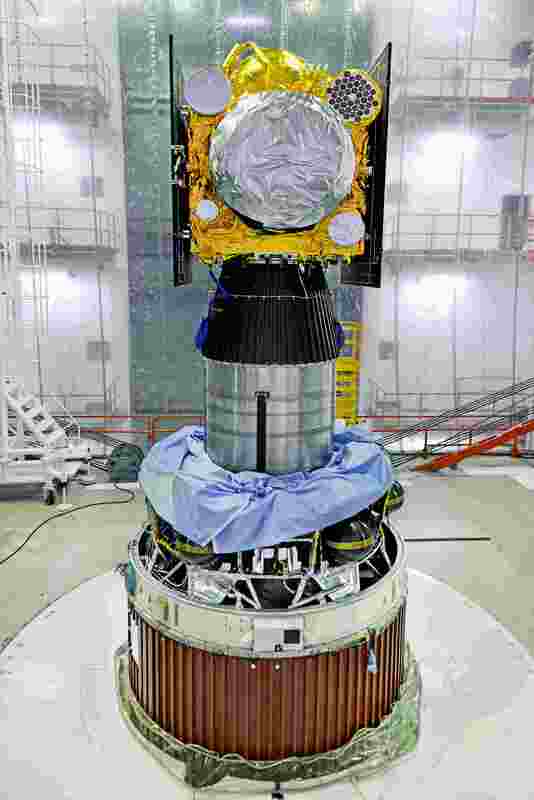 Deployment of the IRNSS 1H satellite was scheduled for T+plus 19 minutes, 25 seconds, but the command to separate the spacecraft was issued about a minute-and-a-half earlier, according to ISRO’s launch commentator. IRNSS 1H’s on-board engine was supposed to circularize its orbit at an altitude of nearly 22,300 miles (35,800 kilometers) in the first few weeks after launch. 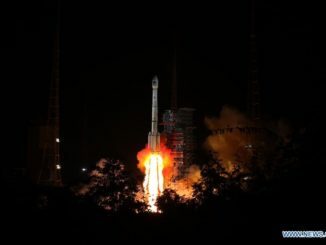 The satellite’s final operational geosynchronous orbit was to be tilted 29 degrees to the equator, a perch that would have oscillated north and south of the equator at 55 degrees east longitude. In that orbit, IRNSS 1H was to stay constantly in the sky over India. Like its predecessors, the IRNSS 1H satellite was built for a 10-year mission. Unlike U.S., Russian, European and Chinese navigation fleets designed for global reach, India’s navigation satellite constellation is intended to provide positioning services over the country’s domestic territory and neighboring nations.